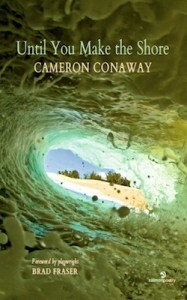 Until You Make The Shore by Cameron Conaway is another poetry book in the growing and much-welcomed trend of long poetic narratives receiving publication, and it does not disappoint. The framework of the book is centered around four girls in the juvenile justice system (specifically, Pima County Juvenile Detention Center), where the poet plays a supporting role as a creative writing teacher. In traditional narrative poetry, a poet needs to decide whether to be a narrator (not be present in the poem) or storyteller (be present in the poem); however, one gets the feeling that Conaway has managed to employ both: the poet makes himself known in the poem and is thus a storyteller, but the girls are the poem’s collective narrator. It is a dichotomy that works so well together. In the book’s forward, playwright Brad Fraser notes that the book reads like a stage drama, and he was correct. While there is a little dialogue between poet and his students, there is a lot of unwritten communication happening. There are four stages of the system the youth have to go through before making it out, and Conaway establishes this as the parts of his book, and designates one girl for each part. Conaway is not only a poet but also a social justice advocate, and while he obviously has had personal experiences with the system, the people in the book — and the story told — are fictitious. There is a lot of white space in the book, which helps the reader understand how the book should be absorbed. Unfortunately the poem’s layout is not suitable for the Web, making it difficult to provide readers with a sampling of the work as it is written. For the poem below, I have modified its layout by necessity. The underscore (_) denotes white space within the line of the poem. Removing white space altogether does not feel right upon reading. Note, italicized points in the book refer to the poet speaking; this is reversed below. Precious is the name of one of the girls, each girl gets about ten poems. _____________________she meant ___________I don’t dream enough? Conaway’s detailed attention to craft, excellent use of imagery, his novel approach to storytelling, and his passionate commitment to social justice make Until You Make The Shore a must-read. I finished the book wishing for more, and that is exactly what an open ending of a well-written story should do. Four out of five stars. Published by Salmon Poetry, 73pp.